Our expertise in custom stonework is second to none. If you can dream it, we can make it a reality. At HGH Granite, we have been refining our capabilities in custom stonework for more than 85 years. Our portfolio of custom architectural features demonstrates the exceptional quality and limitless possibilities of granite, including everything from wall claddings to granite Persian rugs. Simply tell us what you’re looking for and we can supply it. We work with contractors, architects, landscape architects and designers, providing the expert insight and product knowledge to create truly exceptional works of art. We will even provide physical samples of our globally sourced granite to ensure your confidence in the material being supplied. For your added peace of mind, we can expertly manage the entire project from concept development to installation. 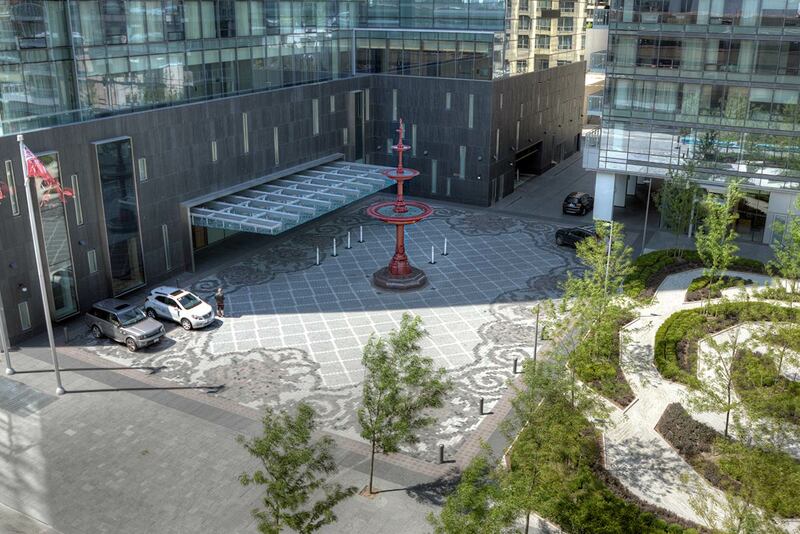 Granite Persian rug and sidewalks supplied to Aldershot Landscape Contractors for Four Seasons Hotel and Residences, designed by Claude Cormier of Montreal.